Rotherham United make the short trip to Lincolnshire to take on Scunthorpe United at Glanford Park in the League One Play-Off first leg. 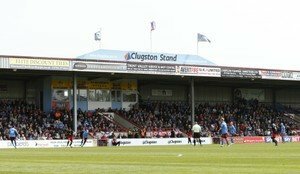 The Iron moved from the Old Showground to Glanford Park in 1988 with the Millers first visit there being in May 1989 when the game was goalless. The first time the Millers beat Scunthorpe at Glanford Park was in a League Cup game in August 2001. Alan Lee and Mark Robins gave the visitors a two-nil win on the night. Last time out at Glanford Park was in February this year when Joe Newell opened the scoring for Rotherham and Semi Ajayi doubled the lead with twenty minutes to go. Lee Novak made it two-one two minutes later but the Millers hung on for their first ever league win there. Ajayi, Josh Emmanuel, Anthony Forde and Michael Smith saw yellow for the Millers that afternoon with the Iron having Marnick Vermijl, Duane Holmes, Ivan Toney and Novak also being booked.